Mary and I love January; it is our favorite month of the year. 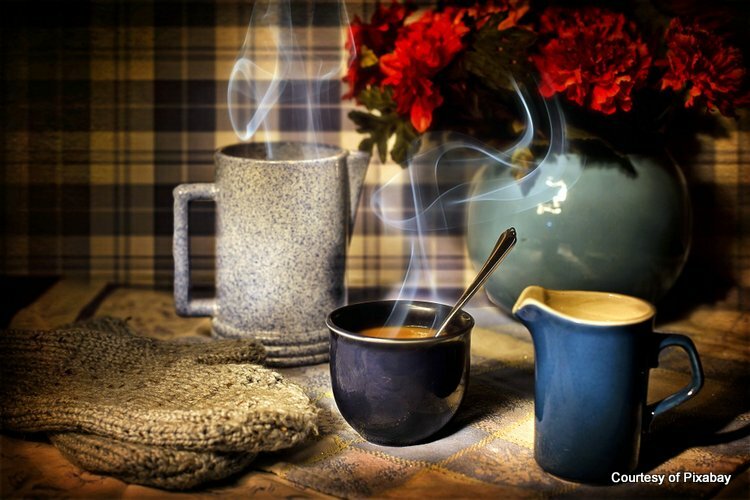 We like cozying up inside with our wood fire, working on indoor projects and cooking yummy dishes. I'm working on a new cabinet for our kitchen and Mary is doing art and working on her next children's book. The hot humid summer days we get here can wait a while! 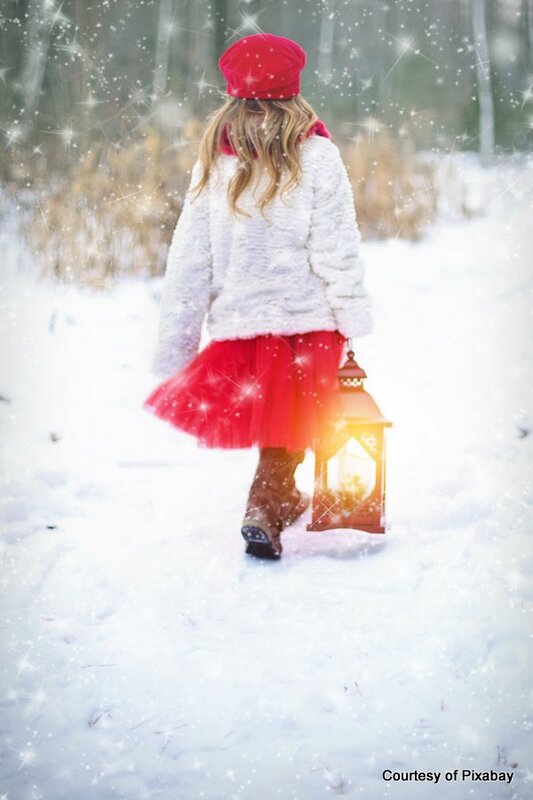 It's back to work and school for many; some of us wishing Christmas and the holidays lasted just a bit longer and some of us being happy to return to typical routine. Our indoor spaces have returned to normal having been adorned with evergreens and decorations. Outside lights have been taken down and the holiday decorations packed away. Mary and I enjoy this time of the year very much. It's not a popular opinion, but the way we look at things can surely make a difference in how we feel about them. Further down in our newsletter, we share why we like this season so much. 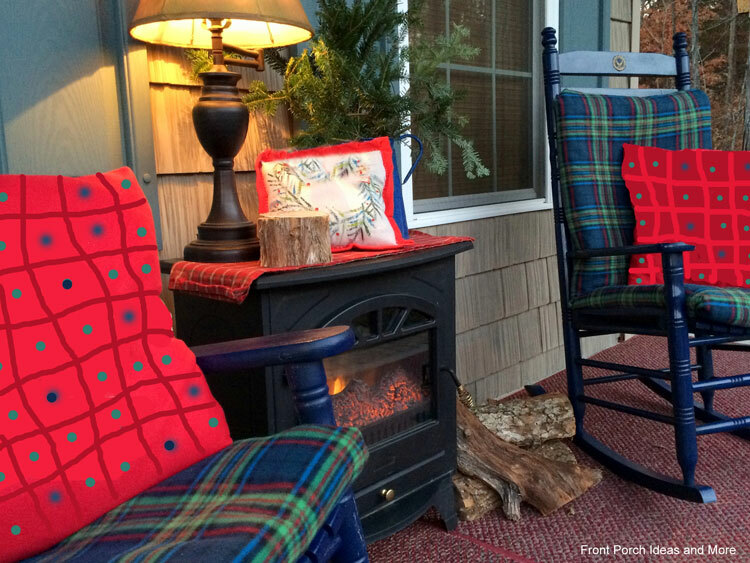 We've decorated our porch for winter complete with an electric fireplace to give it a sense of comfort on these cold days (might not work as well on a balmy Florida or Texas porch). Nevertheless, we like adding a splash of color to otherwise bare-looking surroundings during the winter season. And to be clear, we're not heating the outdoors; we only use the fireplace for the ambiance it provides. We've turned the heating portion off. 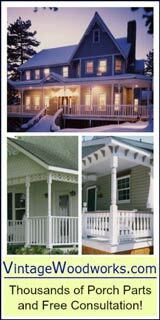 Is There Value in Adding or Upgrading a Front Porch? 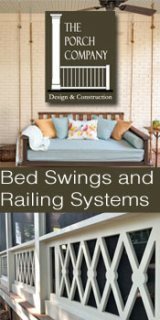 Need Handrails for Your Porch? 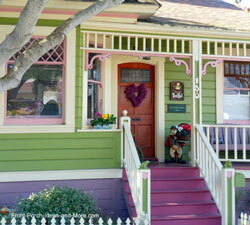 January is an excellent month to start planning your home's upgrades and possible enhancements. 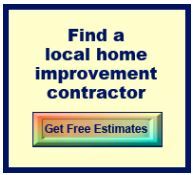 Before beginning any remodeling or building project for your home consider the cost (of course!) but also the potential return on your investment. 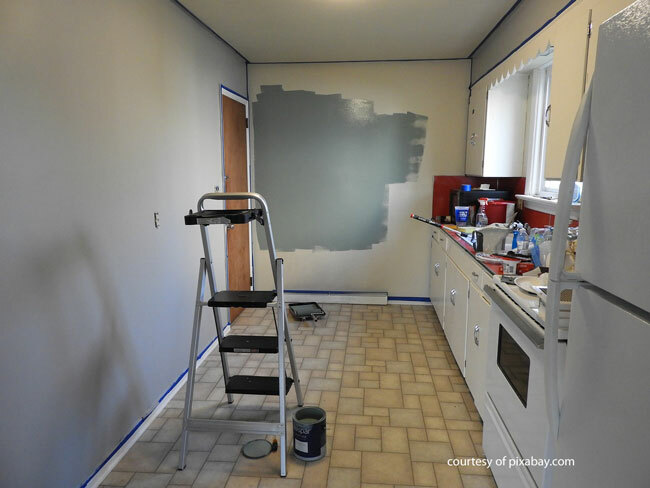 Then too, consider the intrinsic value of the remodel if you plan on remaining in your home for some time to come. 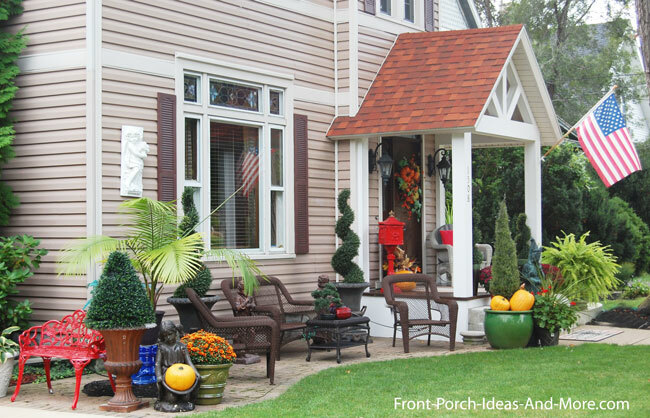 Interestingly, porches have a slightly higher return. 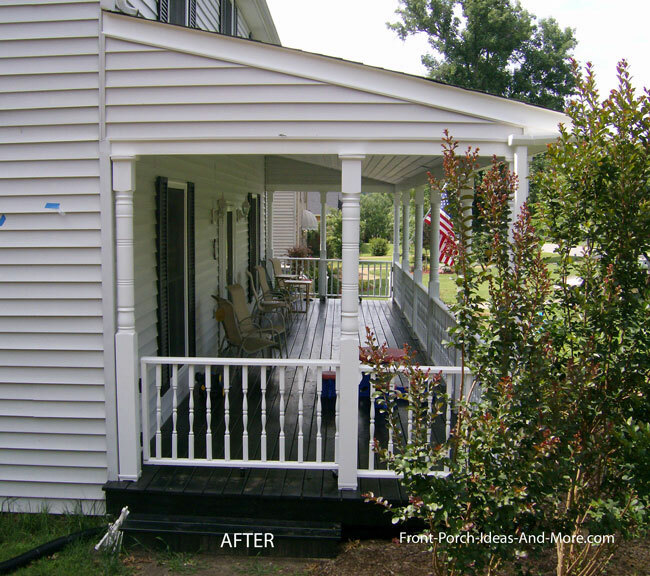 On average a new porch will cost approximately $21,000 depending on size, design, choice of materials, and amenities. 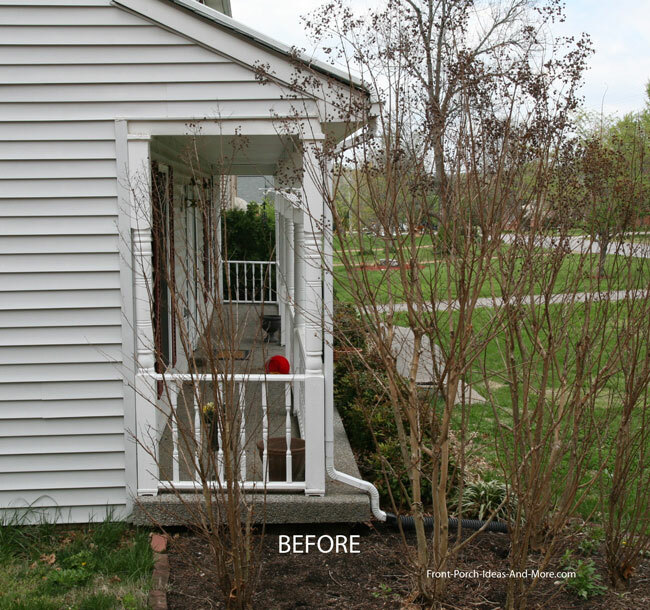 Look at these before and after photos of a porch remodel project. 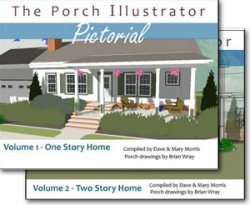 Listen to this: For most of the country, adding a porch will provide an average return on investment of 84% according to this source. We also discovered that building a patio has an even higher return, and in some cases, yield of return of just over 100% according to this source! 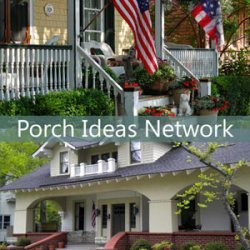 Based on findings, here's an idea you might consider especially if you want to expand your front porch but also minimize costs. 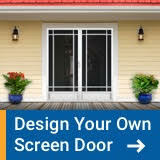 This idea is also quite handy if you are not able to expand your porch because of local building codes (such as setback rules) or design limitations. 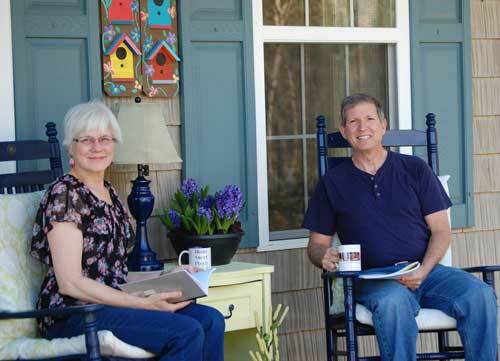 Mary and I call them "patio porches" and have seen many on our travels throughout the USA - like the one shown below. 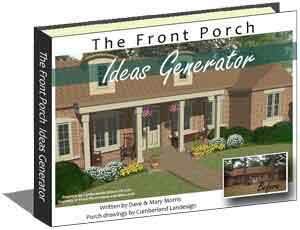 Patio porches add lots of functional outdoor space along with curb appeal. Find more ideas in our patio porch section. 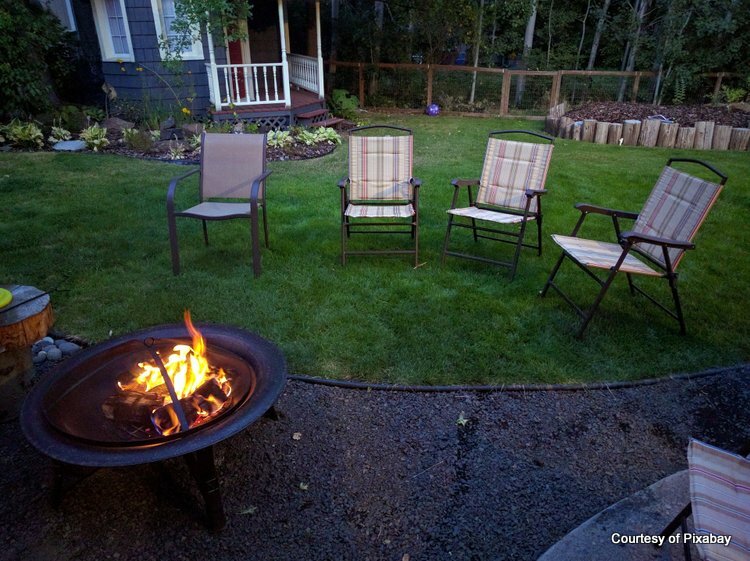 As you begin thinking of the coming months, here's what many believe will be the outdoor trends for 2019. 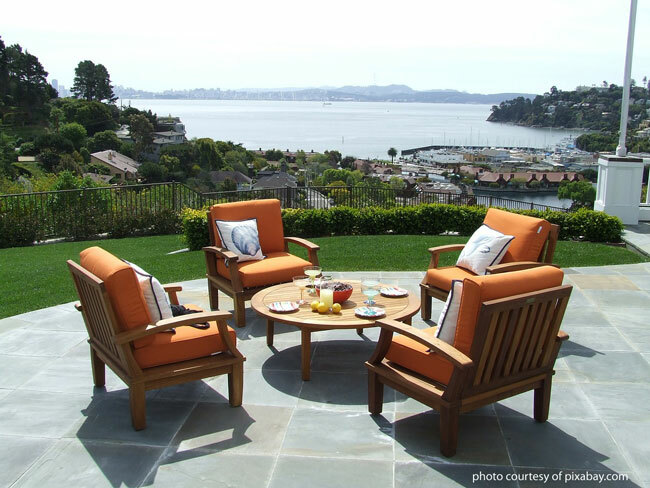 We'll see more outdoor furniture that can be easily moved and are simple and lightweight. These pieces can be stored easily to create extra space in addition to providing a functional outdoor area. 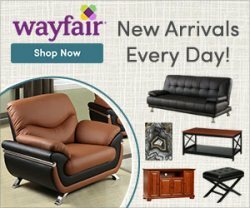 Modular or sectional pieces will gain popularity too. Go bold and vivid; reds, purples and variations of the same will be most popular. You'll probably see lots of blue and green colors too. Interesting lighting fixtures will be used to create a warm glowing appeal in the evening. 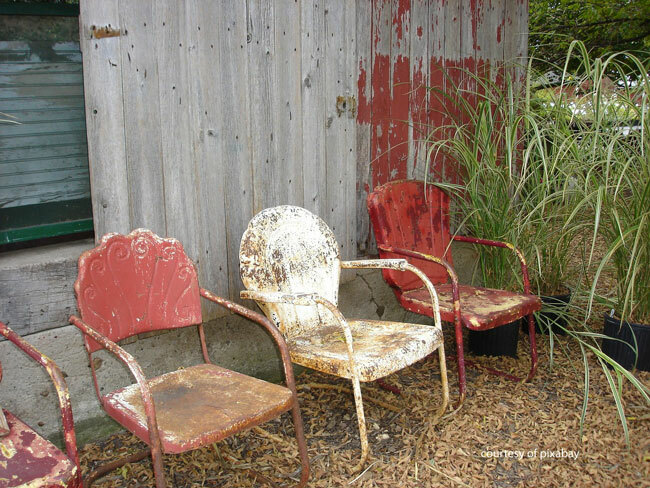 Vintage pieces of furniture will be seen on lots of porches and patios. The retro look is popular especially for more authentic pieces. Want Birds to Visit Your Home This Winter? We found that one of the best ways to keep birds returning in the winter is to provide fresh water for them. 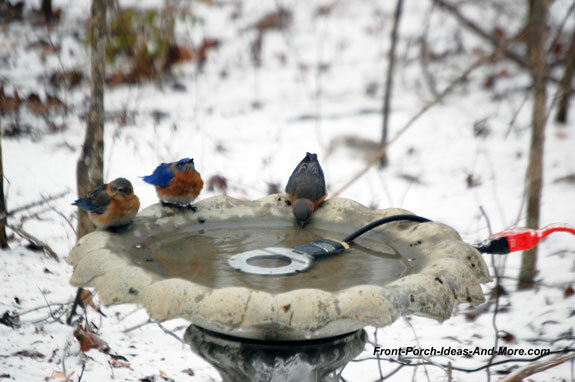 We especially love that bluebirds visit our bird bath in the winter. But how do we keep the water from freezing? Check this out to learn our secret. Winter is a favorite time to cozy up with good books. 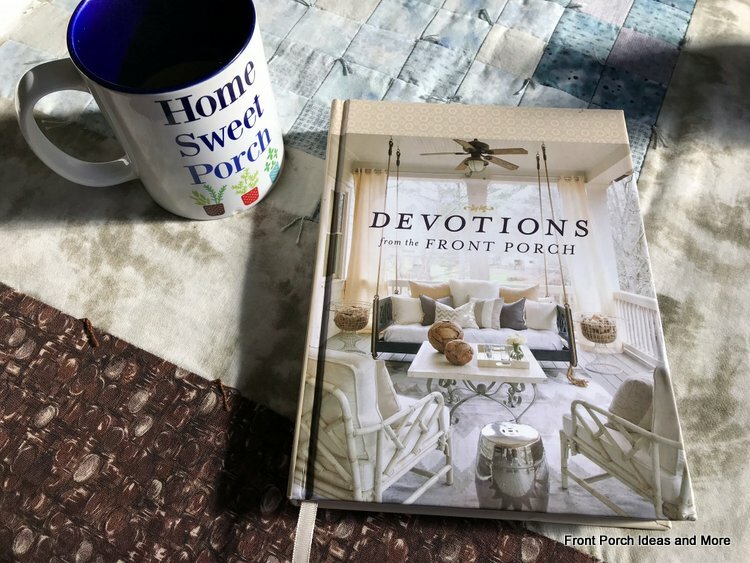 This book, Devotions from the Front Porch, written by Stacey J. Edwards, is terrific! Wished we had written it ourselves. Mary's sweet friend Linda gave it to her. You can find it on Amazon right here. If you love old-time goodness like lilac trees, porch swings, planting flowers, strawberry pretzel salad and daydreaming - then this book is chock full of little stories and devotions that complement them. And if that's not enough, there are variation of this book for those who love beaches, gardens, kitchens, lakes and mountains. We bet they are equally as nice, but of course, we especially love this one from the front porch. We know that many people dread winter or simply do not like it. Perhaps that's you. Mary and I have a fond appreciation for winter that we'd like to share with you. We don't expect winter to become your favorite season if warm weather is what you love, but maybe you will find at least one reason to enjoy the colder days of the year. Mary and I have lived many winters in colder states. From Wyoming and Nebraska to Alaska and New Hampshire - and states in between too. So we understand cabin fever and all the yuck from winter slush and all. And for sure, we don't live in true winter weather here in Nashville. But winter gets a bad rap and we just wanted to share with you a few reasons why it is endearing to the two of us. Plus our wedding anniversary is in February and that just makes winter even that much nicer to us. It takes just one step for someone to fall. Porch handrails can be invaluable. We know that people appreciate our porch handrails and we only have two steps to climb. Metal handrail kits make it easy to safe-proof you porch, deck, or stoop stairs. And they look curb-appealing too. 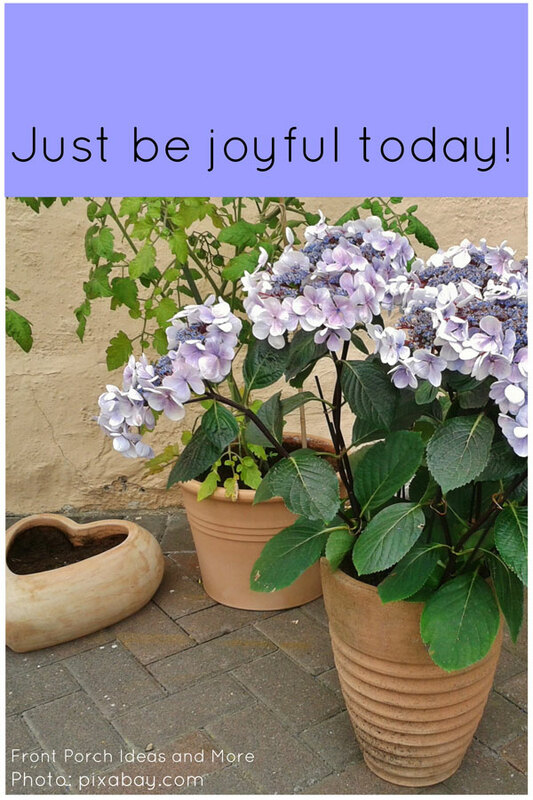 May you find joy, peace and solace in your everyday life. That's what we're wishing for you today. Life is busy and life is full. If you can, pause for a moment and just relax. 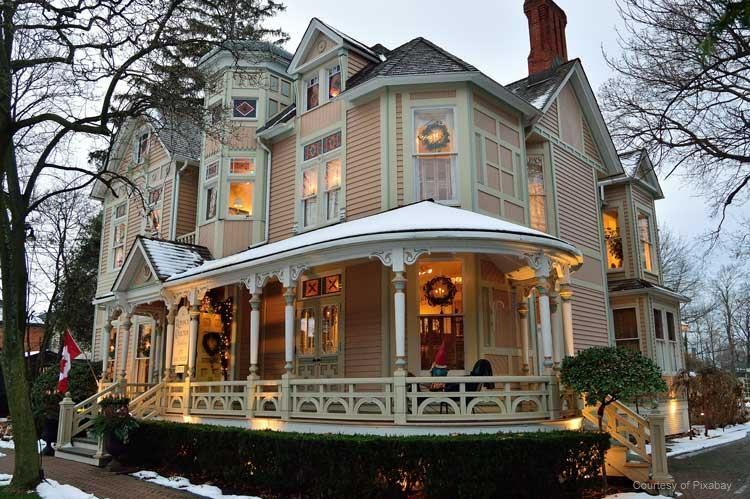 Can you imagine being at this wonderful home in the midst of winter? While we don't know quite where it is, we can imagine the crackling fire inside, the pies coming from the oven and the comfortable feather beds. Imagination can spark a host of wonderful feelings and experiences! Thank you for taking time out of your busy day for us. The two of us appreciate you much.